Wondering how to grow your Facebook following without resorting to paid advertising? Want to discover the secrets to getting more fans and driving them to your blog? To learn how one marketer has built several massive Facebook communities, all through organic growth, I interview Collin Cottrell. In this episode I interview Collin Cottrell, the founder of WhitetailOverload.com, a website dedicated to deer hunting. He’s quickly built a massive following of more than 800,000 fans on his Facebook page, all without advertising. Collin also founded OutdoorOverload.com. In this episode Collin will explore how he built his Facebook pages rapidly, without using paid advertising. You’ll discover how to cross-promote your Facebook pages to grow your following and what types of posts get the most attention. 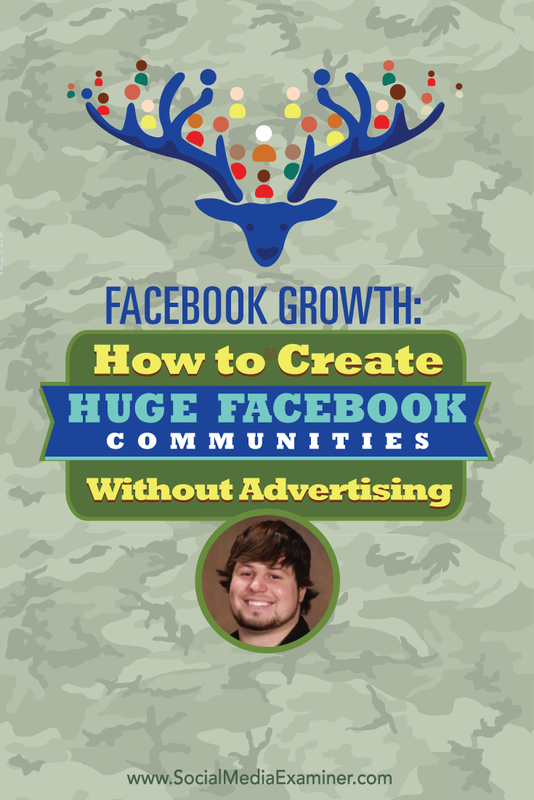 Listen as Collin Cottrell shares how to create huge Facebook communities without advertising. Collin, who grew up in the Midwest, started hunting with his dad at an early age. He would go to hunting camps with his father and uncles, and they would sit around the campfire, tell stories about hunting and talk about life. Collin found he had a passion for hunting, and wanted to figure out how to make a living from it. In high school Collin started building websites, doing graphic design and using social media (at the time it was MySpace and the beginning of Twitter) to build his way into the hunting outdoor industry. For example, he worked on Bowhunting.net (which was on AOL in 1994 and then launched fully in 1996). Collin also attended hunting and outdoor trade shows, such as the Archery Trade Show, where he would interview the different dealers and put the videos on their websites. The hunting industry needed a new way to market to their growing customer base with social media, Collin says, and that’s how he found his niche. At the same time Collin was going to trade shows, he was building his own marketing company on the side. Developing relationships with major players in the hunting industry was a huge boost to his business. Listen to the show to discover the similarity between how Collin and I got started, even though we’re in very different niches. Around 2007, Collin launched a graphics/web design/marketing agency with a focus on the hunting and outdoor industry. Facebook pages were just being introduced, so Collin decided to create hunting-related pages to build communities. In addition to the bowhunting page, he started pages for shed hunting, turkey hunting and more. Facebook was different at the time, Collin recalls. If you put out good content, and you had a good following, you could reach a lot of people. He put interesting, informative, value-driven content on the page, such as questions, pictures and videos. A short time later, Collin decided to create a whitetail deer hunting page, since it’s the top tier in the hunting industry in America. He did crossovers from the other pages to get fans to the new one. This Facebook page grew organically very quickly through contests, content and posting several times a day. A year and a half ago, when they were at 500,000 fans, they were able to reach 25 to 50 million people a month. Whitetail Overload launched August 1, 2014. Whitetail Overload grew very quickly through giveaways and good content. Since Collin is a web and graphic designer, he was able to build landing pages and apps for his giveaways right in Facebook, which drove people to his pages, as well as other large hunting-related niche pages. Giveaways, Collin shares, do not work as well now. Today, it’s better to drive people to your website to grow your following. Listen to the show to discover how Collin’s Facebook pages got him business for his agency. Collin talks about the morel mushroom hunting page he started recently. To grow his following, Collin posted to his other pages: “If you are into morel hunting, check out this page.” And he would share the link. This type of sharing jumpstarts a fan base, Collin explains. After that, just provide good content for that community, which people share and comment on. Be sure to comment back. The morel mushroom hunting page is up to 50,000 fans already. Collin grew the Morel Mushroom Hunting page by posting about it on his other pages. While he occasionally cross-posts content between pages, Collin mostly just posts to the other pages, and asks fans if they’re interested in the other communities. He’ll say “join” this page, since Facebook doesn’t like to show posts that ask people to “like” something. 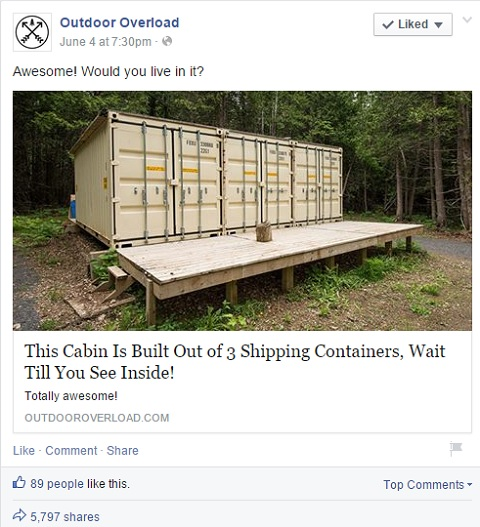 Collin explains what types of content he posts to Whitetail Overload. Since it’s a deer hunting page, he shares hunting-related content, wildlife growth and more. It’s the whole deer-hunting lifestyle. He posts products, memes, photos and videos. Collin is now creating blog content too. Whitetail Overload shares content that is in line with the deer-hunting lifestyle. The whole point is to share your passion and personality with the content you create. People don’t want to talk to a robot. They know there’s someone behind the page, so try to stay real. Collin shares the things he likes, because he thinks his community will like them too. Listen to the show to hear how to find things in a seasonal niche to post in the off season. Collin explains what led to his decision stop doing design and marketing for other companies and just focus on his niche blogs. 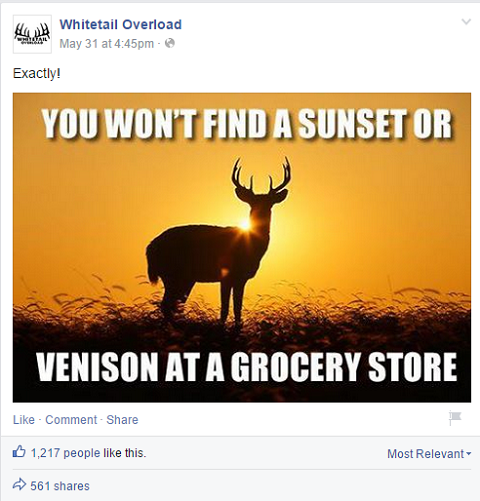 He decided to experiment with creating original content for Whitetail Overload and posting it to all of his niche communities. This was in June 2014. He would put up a blog post, and it would get 30,000 to 100,000 people clicking through to the website. It was all the encouragement he needed to disassemble the agency and go full throttle with his niche. Each month, he drives 2 million sessions from Facebook to Whitetail Overload. Collin’s strategy for driving traffic to his blog is twofold. He continues to run the community on the Facebook side, and posts good content organically within Facebook, which is mostly photos, status updates, and so forth. Plus, he mixes in content from his blog. Collin now also posts links to original content on his Facebook pages. Collin’s priority right now is building up Outdoor Overload, since it encompasses a broader audience. For that, he is publishing three to five posts per day on the blog and then pushes them to his full network on Facebook. He posts frequently on Facebook (five to seven times per day on each of the pages and sometimes he posts the same blog link twice in one day). Listen to the show to learn how Collin monetizes his blog. Find the niche you are passionate about, and do some research to find out what’s out there on the other social networks. Then start a social community and build it up. Take the time to create good content, including videos, and find people to help you do it. Do blogs, photos, etc., because that’s what will help you build those communities, drive traffic and eventually monetize. Listen to the show to discover the most important thing you need when developing your community. This app lets you do Facebook Messenger without having to go to Facebook. It’s called Goofy. 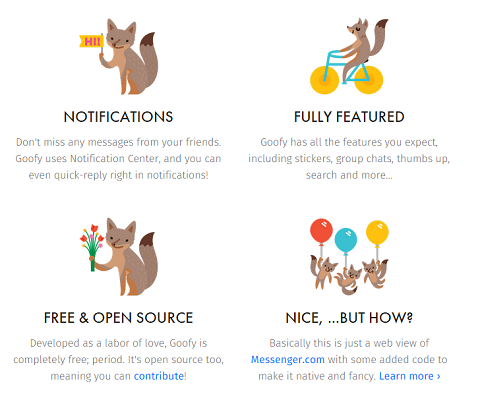 The Goofy app is a free, unofficial Facebook Messenger client for the Mac. Keep the app in the dock. Then when you need to send a message, just open it up. It’s much less distracting than going into Facebook or checking Facebook on your phone. Listen to the show to learn more and let us know how the Goofy app works for you. The Social Media Marketing Society is a professional developmental, membership-based community where social media marketers come together to get monthly original live training and connect with peers. Here are six reasons why you should consider it. #1: Your peers trust Social Media Examiner. #2: Connecting with other marketers is valuable. #3: Step-by-step, tactical training is hard to find. #4: It’s hard to keep up with the pace of change. #5: Joining the Society will save time. #6: The Society is something you can afford. These people have already joined the Social Media Marketing Society. It’s only $40 per month and enrollment is only open June 2015. It will not open again until 2016. You can cancel at any time. 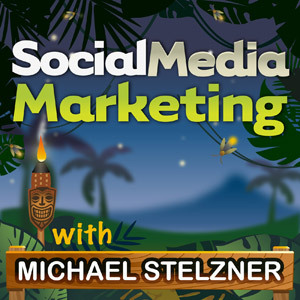 Check it out at SMMarketingSociety.com and try the sample course. Go to Collin’s website to connect with him on Facebook, Twitter, Instagram or LinkedIn. Learn more about WhitetailOverload.com and OutdoorOverload.com. Join Whitetail Overload and Outdoor Overload on Facebook. Check out Bowhunting.net and the Archery Trade Show. Explore the bowhunting, shed hunting, turkey hunting and morel mushroom hunting pages. Check out the Goofy app. What do you think? What are your thoughts on building Facebook communities? Please leave your comments below. 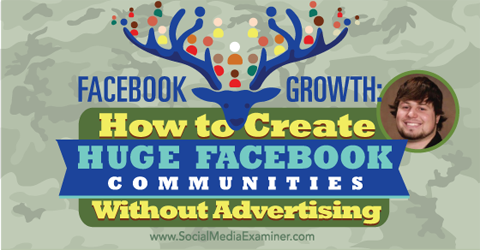 Tips for creating huge Facebook communities without advertising.